I, Wendy Beresford, am committed to protecting and respecting your privacy. This policy, together with any other documents referred to on it, sets out the basis on which any personal data I collect from you, or that you provide to me, will be processed by me. Please read the following carefully to understand my views and practices regarding your personal data and how I will treat it. Personal data – The GDPR applies to ‘personal data’ meaning any information relating to an identifiable person who can be directly or indirectly identified in particular by reference to an identifier (as explained in Article 6 of GDPR). For example, name, passport number, home address or private email address. Online identifiers include IP addresses and cookies. I, Wendy Beresford, am the data controller and I am responsible for your personal data (referred to as “I”, “me” or “my” in this privacy notice). WHAT DATA DO I COLLECT ABOUT YOU? Identity Datamay include your first name, maiden name, last name, username, marital status, title, date of birth and gender. Contact Datamay include your billing address, delivery address, email address and telephone numbers. Transaction Datamay include details about payments between us and other details of purchases made by you. Technical Datamay include your login data, internet protocol addresses, browser type and version, browser plug-in types and versions, time zone setting and location, operating system and platform and other technology on the devices you use to access this site. Profile Datamay include your username and password, purchases or orders, your interests, preferences, feedback and survey responses. Usage Datamay include information about how you use my website, products and services. Marketing and Communications Datamay include your preferences in receiving marketing communications from me and my third parties and your communication preferences. I may also process Aggregated Data from your personal data but this data does not reveal your identity and as such in itself is not personal data. An example of this is where I review your Usage Data to work out the percentage of website users using a specific feature of my site. If I link the Aggregated Data with your personal data so that you can be identified from it, then it is treated as personal data. I require your explicit consent for processing sensitive data, so I will ask you to sign an agreement to confirm your consent to this processing. 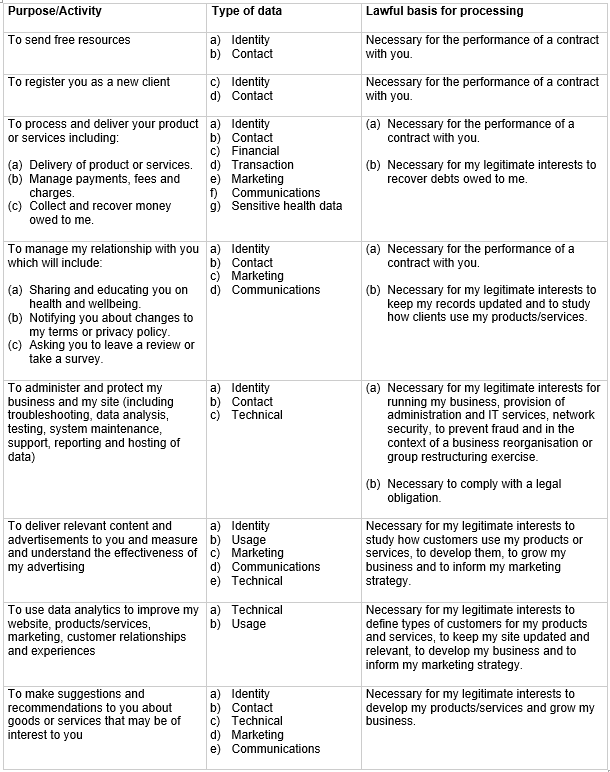 Where I am required to collect personal data by law, or under the terms of the contract between us and you do not provide me with that data when requested, I may not be able to perform the contract (for example, to deliver services to you). If you don’t provide me with the requested data, I may have to cancel a service you have ordered but if I do, I will notify you at the time. Contact, Financial and Transaction Data from providers of technical, payment and delivery services such as GoCardless and Stripe based inside and outside the EU. Where I need to perform the contract between us. Where it is necessary for my legitimate interests (or those of a third party) and your interests and fundamental rights do not override those interests. Where I need to comply with a legal or regulatory obligation. Set out below is a description of the ways I intend to use your personal data and the legal grounds on which I will process such data. I have also explained what my legitimate interests are where relevant. I may process your personal data for more than one lawful ground, depending on the specific purpose for which I am using your data. Please email me at wendy@wendyberesford.com if you need details about the specific legal ground I am relying on to process your personal data where more than one ground has been set out in the table below. I will never share your personal data with any third party for marketing purposes. Where you opt out of receiving my marketing communications, this will not apply to personal data provided to me as a result of a product/service purchase, warranty registration, product/service experience or other transactions. If I wish to use your personal data for a new purpose, not covered by this policy, then I will provide you with a new notice explaining the new use prior to commencing the processing and setting out the relevant purposes and processing conditions. Where I use providers based in the United States, I may transfer data to them if they are part of the EU-US Privacy Shield which requires them to provide similar protection to personal data shared between the Europe and the US. If none of the above safeguards is available, I may request your explicit consent to the specific transfer. You will have the right to withdraw this consent at any time. Please email me at wendy@wendyberesford.com if you want further information on the specific mechanism used by me when transferring your personal data out of the EEA. I have put in place appropriate security measures to prevent your personal data from being accidentally lost, used or accessed in an unauthorised way, altered or disclosed. In addition, I limit access to your personal data to those agents, contractors and other third parties who have a business need to know such data. They will only process your personal data on my instructions and they are subject to a duty of confidentiality. I have put in place procedures to deal with any suspected personal data breach and will notify you and any applicable regulator of a breach where I am legally required to do so. To determine the appropriate retention period for personal data, I consider the amount, nature, and sensitivity of the personal data, the potential risk of harm from unauthorised use or disclosure of your personal data, the purposes for which I process your personal data and whether I can achieve those purposes through other means, and the applicable legal requirements. By law I have to keep basic information about my customers (including Contact, Identity, Financial and Transaction Data) for six years after they cease being customers for tax purposes. In some circumstances you can ask me to delete your data: see below for further information. In some circumstances I may anonymise your personal data (so that it can no longer be associated with you) for research or statistical purposes in which case I may use this information indefinitely without further notice to you. Request a copy of the personal data which I hold about you. Request that I correct any personal data if it is found to be inaccurate or out of date. Request your personal data is erased where it is no longer necessary to retain such data. Object to the processing of your personal data where applicable, ie where processing is based on legitimate interests, direct marketing and processing for the purpose of scientific/historical research and statistics. Request a restriction is placed on further processing, where there is a dispute in relation to the accuracy or processing of your personal data. Right to withdraw your consent to the processing at any time, where consent was your lawful basis for processing the data. However, I may charge a reasonable fee if your request is clearly unfounded, repetitive or excessive. Alternatively, I may refuse to comply with your request in these circumstances. I try to respond to all legitimate requests within one month. Occasionally it may take me longer than a month if your request is particularly complex or you have made a number of requests. In this case, I will notify you and keep you updated. My website may include links to third-party websites, plug-ins and applications. Clicking on those links or enabling those connections may allow third parties to collect or share data about you. I do not control these third-party websites and are not responsible for their privacy statements. When you leave my website, I encourage you to read the privacy notice of every website you visit.